One of our New Year’s resolutions this year was to listen to more live music. We haven’t done a great job on it, but plan to make up for that this week, as we will be seeing Mumford & Sons on Wednesday and attending the Governor’s Ball music festival on Friday, Saturday, and Sunday. 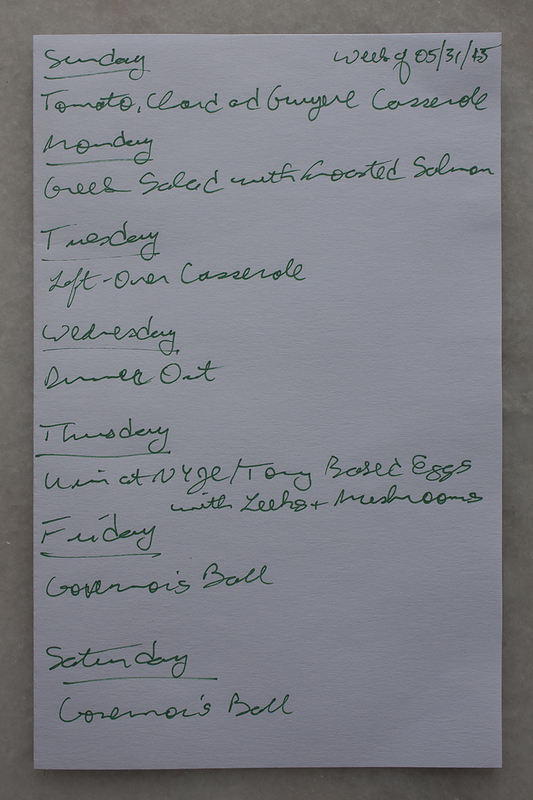 We won’t be making many dinners, but we do have some great dishes planned for this week. We’re also looking forward to the food at Governor’s Ball, especially Mighty Quinn’s BBQ, Mayhem & Stout, Asia Dog, and Cafe Habana for lunch/dinner and Cool Haus and Van Leeuwen for ice cream. First up for this week is a Sunday dinner of Tomato, Chard, and Gruyère Casserole, or panade, an ambitious dish ideally suited for a Sunday. Kim is going to tackle this one, though Tony had already done his part by finding space in the fridge for 5 1/2 pounds of swiss chard. This dish makes a lot, which will come in handy, as we have to attend the annual shareholders’ meeting for our building on Tuesday and won’t really have time to cook afterwards. We’ll make fish on Monday night, specifically, Greek Salad with Oregano-Roasted Salmon, a dish that uses plenty of fresh oregano, which, if you haven’t used it before, it worth buying for how great it smells alone. The dish is pretty quick to make, so perfect for a weeknight. We ended up with a lot of left over leek last week when we made Food & Wine’s Tarragon Chicken with Spring Greens. (Not leeks, but leek; the one we used was enormous – about two to three times the size of what we used to consider a “big” leek.) Tony wanted to make something simple that also would use up the leek and settled on Eggs with Leeks and Mushrooms. The recipe makes 4 to 6 servings, so we’ll probably end of having the leftover for breakfast the next day.